As was the case last year, I was thankfully invited to the “Tast del Decenni” of the DOQ Priorat and DO Montsant in Falset. I saw thankfully as while from time to time gracious winemaking friends in the region will pull out old vintages to taste, it’s nearly impossible to find a collection of archive wines to sample like this. 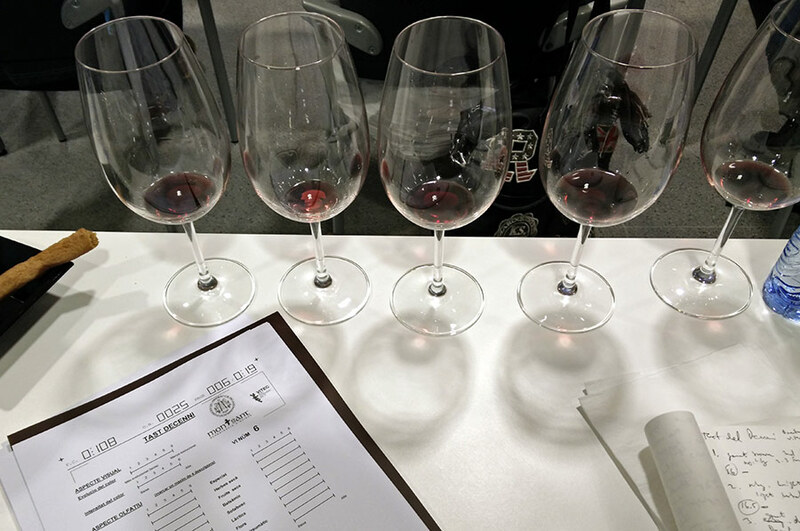 For those who didn’t read the 2014 article (because obviously, links are for suckers…), this is a tasting they do every year in the region during the Fira del Vi wherein winemakers present their wines from a decade previous to a tasting panel of experts. So in this case, we were granted a window back to 2005. The 2005 vintage was one that was incredibly hot. As I sat writing this article in 37C weather that shows no sign of quitting, it made me wonder if ironically, 10 years later we’d be headed for a similar vintage. Naturally no one knows until the harvest comes in but so far, no one seems worried. But, the problem with this 2005 vintage was the fact that Grenache (of which 40% of the vines are in Priorat) is a peculiar grape. As a defense mechanism, when there is a shortage of water, the vine will steal it from the grapes and you get instant raisins. Such was the case with a number of cellars and it was one of those rare years where many produced a dessert wine, of which few remain and most are absolutely incredibly. The 2007 vintage also saw a “dessert year” to some extent as well. Beyond the weather of the year, this decade tasting answered that question that I receive a lot when doing private tours which is, “How long will these wines age?” If you look at the 2005 vintage, the simple answer is, “At least ten years.” Unlike the 2004 which for some reason had a lot of wines that, to me seemed to be in rapid decline, countless in this tasting were still incredibly strong and had years of life left in them if not another 10 years. So, as follows, here are my tasting notes of these 20 wines. Keep this in mind as we worked through all these wines in bit less than two hours so tasting notes were unfortunately at a bare minimum. You’ll note that I use the 20 point system instead of my preferred three star system as when doing such a pinpoint tasting (one vintage, one region, aged wines), one needs a more finite system, although it is used with great care. Garnet brown with good secondary red fruit notes and generally balanced aromatically. Body is minor secondary and mostly tertiary fruit at this point although still generally full. Bright ruby with noted brett aromas and lacks all but the lightest of herbal notes. Full in the mouth but with only minor tertiary fruit. Dull garnet with leather and animal touches, dried herbs. Decent secondary fruit notes comes up in the body but it holds little structure at this point. Bright ruby with good primary fruit and an elegant nose with touches of licorice and spice. Still holds quite good structure in the mouth and pleasing acidity in the finish. Bright ruby brown with tasty primary fruit, spices and loads of forest floor. Racy and wild in the body with good balance. Bright garnet in the glass with balanced red fruit aromas, primary and secondary fruit. Elegant in the mouth with lingering acidity. Dull brown/garnet. General spices but not overflowing with any specific aspect to latch on to. Full in the mouth overall but flat in character which with a good deal of acidity in the finish. Bright garnet with dried herbs, fruits and light red fruits. Quite hot in the mouth with the alcohol dominating at this point. Bright brown/garnet. A touch animal with licorice and wild spices although obviously at the end of its life. The body has completely fallen out. Bright ruby in the glass and a little animal in the nose but still vibrant and racy. Well-balanced in the body with good secondary fruit and a lingering finish. Bright garnet with good red fruit notes and a touch of balsamics. Secondary fruit in the mouth and a bit aggressive in the finish. Good, but unstable acidity. Bright ruby. Excellent dark fruit notes and dried herbs. Excellent mouth feel with rich, integrated, and full fruit. Brilliant garnet. A touch animal with brett present although good herbal notes and very much alive. Surprising amount of fruit still present in the body although with a short finish. Bright ruby. A bit flat in the nose with minor tertiary elements and herbs hanging on. A touch closed with some toasted herbal notes still present in the body. Bright garnet. Good deal of spice, anise, leather, and cured cherries. Evenhanded in the body and pleasing in the mouth with the fruit more prevalent. Ruby in the glass. Light touches of vanilla still lingering. Elegant and complex fruit as well as a wild spices although the later downplayed. Good deal of acidity in the mouth and primary fruit is fading quite quickly. Rich, bright ruby. Unfortunately mostly alcohol notes and minor touches of tar. Body is quite empty at this point with zero fruit. Brilliant ruby. Fantastic attack of primary fruit as well as dried nuts and herbs that carry along with the fruit very well. Full in the mouth and still holds excellent balance of fruit and acidity. Bright ruby. Good primary fruit and still very full of dark fruits and minor lactic notes. Unfortunately the body doesn’t live up to the very promising aromas and falls rather flat.